I’m a huge Pit Bull fan. They really are a misunderstood breed, not helped by ignorant media reports that attribute blame to pit bulls whenever a dog vaguely resembling a pit attacks a kid or another dog. Of course, there are bad owners breeding and abusing these dogs for fighting. But any dog can be made aggressive. 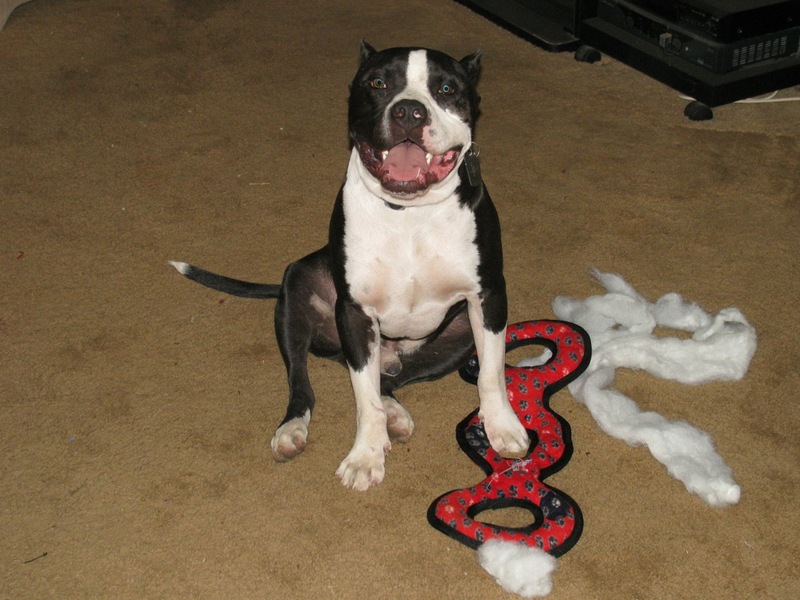 The average pit is a powerful animal who can cause considerable damage unless properly trained and socialized. But so can Boxers, Chows, Shepherds, Dobermans and Ridgebacks and numerous other breeds. The meanest dog I’ve ever met was a foul-tempered dachshund named Hector who delighted in biting the ankles of anyone coming close. Where I grew up, in England, the Staffordshire Bull Terrier (the forerunner of the modern American Pit Bull) was called the “Nanny dog”, because of the their love for children. Most Pits make poor guard dogs as they’re too fond of humans, and are likely to roll over for a tummy rub when meeting a stranger. I rescued an aggressive pit bull puppy in 2001. 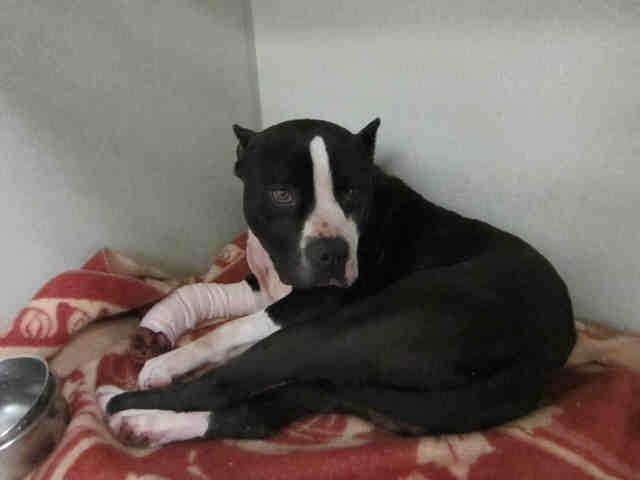 Hannah was thrown from a moving van onto a freeway in east Los Angeles, with the obvious intent of killing her. 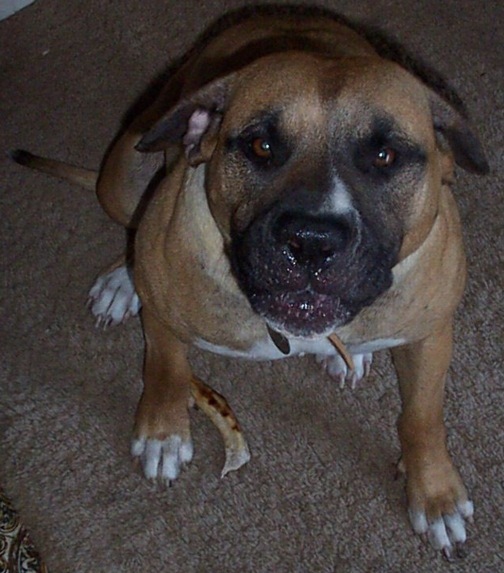 She was a breeder dog, probably used for breeding fighting dogs, and had already had a litter when she was only 6 or 7 months old. She was pretty banged up, but I took her in. 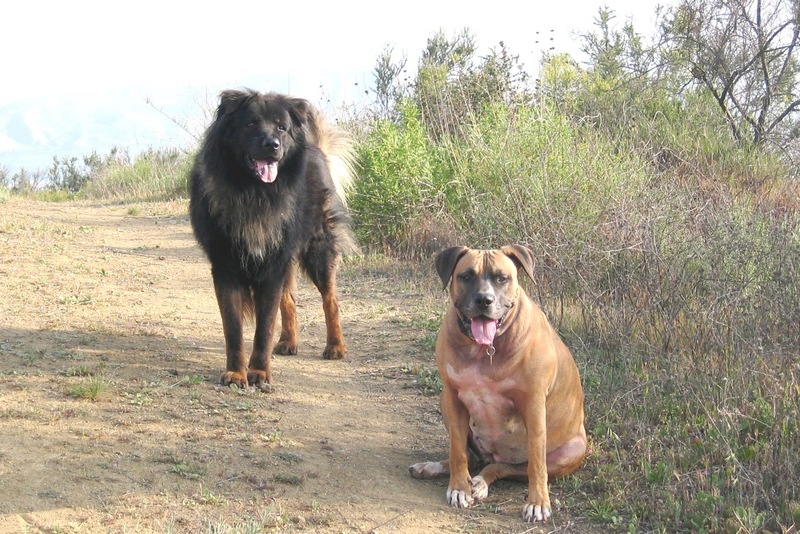 She was a sweet dog, but was still aggressive to strange dogs, although as time passed, she readily accepted new friends and became very attached to my existing dog Oscar, a Rottweiler/Chow mix. Sadly, Hannah died earlier this year, at 11 years old, after a bout of internal bleeding, probably from her spleen. She had a great life, and was a terrific dog, apart from her occasional homicidal tendencies with strange dogs, but very kind to all humans. A few days later, I decided that the best plan, for me, was to rescue another dog. I found Walter through a wonderful group: All For Love Animal Rescue. These great people—in Ventura County, CA—save dogs from high kill animal shelters, and find adoptions, foster homes, provide medical care and evaluate Pit Bulls to make sure that they are suitable candidates for adoption. 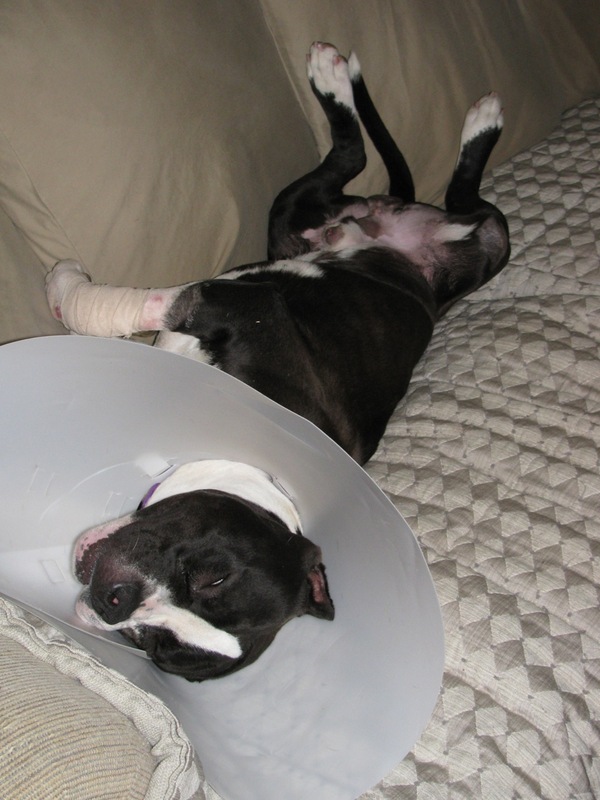 Walter had been hit by a car, and he had a serious injury to his front leg. He was patched up at the shelter, and he was expected to recover. But things didn’t look good. He was a big boy, with a massive head and cropped ears. He was turned in to the shelter by his owners who couldn’t afford medical care. Walter’s future didn’t look bright, as he looked intimidating, and he was in a high kill shelter. Here’s how he looked at the shelter—not a happy dog. I got him home, and started to nurse him back to health. He soon settled in! Here’s Walter today. No trace of a limp, he’s one of the most popular dogs at my local dog park. He has enormous energy, very strong, but truly a gentle dog. 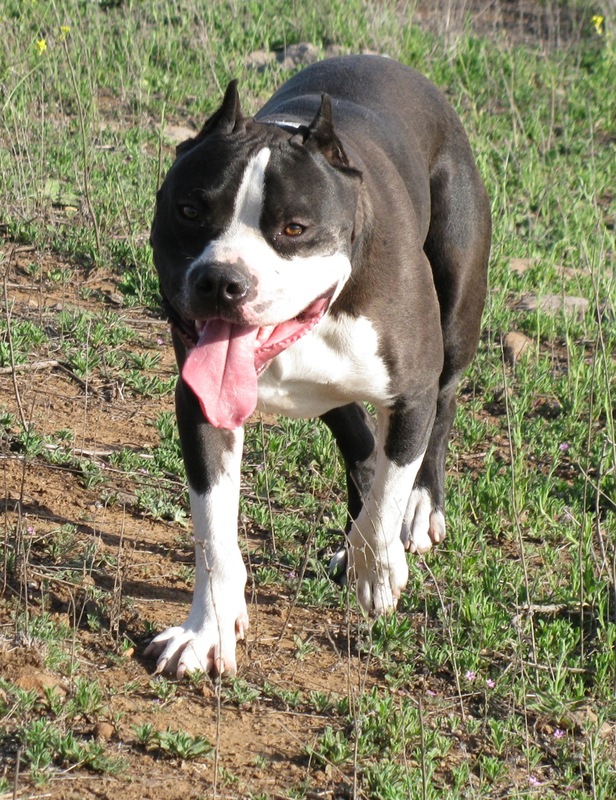 He loves all humans, very friendly with other dogs, and immensely playful. He has a great sense of humor, and there’s never a dull moment around him. If you’re thinking of adopting one of these great dogs, best of luck! Be sure that the dog you are considering has been evaluated, and be prepared to be a consistent leader and guide. Socialization is vital, as with any dog. Make sure that your dog spends as much time as possible around humans and other dogs, and you’ll be rewarded with a loyal, kind companion who will become another Pit Bull ambassador, and help to counterbalance the unfortunate image created by a few irresponsible and cruel owners who have contributed to the Pit Bull being feared by the uneducated. Great post! I feel it’s very important to educate the uneducated and the ignorant on this breed, that’s why I started my pit bull advocation blog here on WordPress. I’m so sorry for the loss of your pit, Hannah. I strongly support adopting and what you did for Hannah and Walter are very honorable things! All for Love Animal Rescue is a very fine organization….I have only the best things to say about all that they do and who they are…..wonderful, kind, compassionate animal lovers…thank you for talking about their great work here! I love Walter too!